Is it possible to do a 200 km cycle ride on a basic non-geared cycle? Yes, many have done that. Is it possible to do a 200 km time bound BRM ride on a single speed non-geared steel frame heavy cycle? Yes, a lot of people across the world have done that. After the last 600 km BRM attempt which I had to give up at 418 km due to an injury, I took a month-long rest and recovery break and restarted my training 3 weeks back. I skipped the last BRM because I felt it was way too early in my training calendar to attempt a 200 km ride. However, 3 weeks into the training and I felt I wanted to attempt the 200. The plan was initially to attempt the 300, but a last minute change of route due to bad route conditions meant that the 300 and 200 were both on a very easy route towards Kolhapur. After a lot of thinking I decided to attempt it on the single speed BSA. I was recently gifted an old BSA Mach cycle by a dear friend, Sagar Wakade. I was planning to use it for my commutes and started riding it on a few days as part of my training. Over the last couple of weeks, I had managed a couple of 40-50km rides on the BSA. Also had managed to ride it up Piranghut climb and Symbiosis Lavale climb. This gave me the confidence to be able to tackle the climbs en route. NM Rao had recently purchased a Montra fixie and had shown interest in attempting the BRM too. 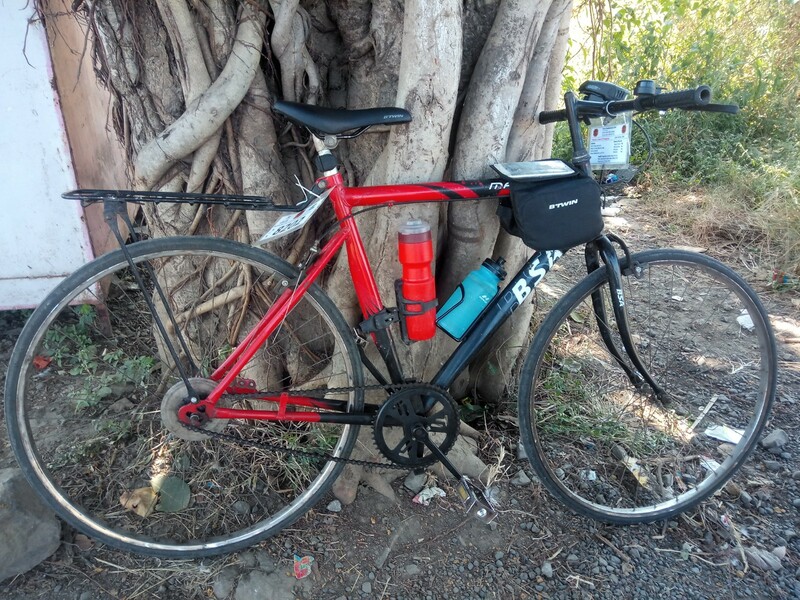 He managed to pull off a century ride to Lonavala right the next day after he acquired the new bike, however, he had some doubts about being able to manage the climbs. I floated an idea to ride to Katraj tunnel (one of the to climbs on route). We planned and executed a night ride and Rao managed to get a PR on the climb, and I was behind my average climb time by an additional 2 minutes. Yes, it was difficult to manage the climb but not impossible. My mind was comfortable doing 200 on the single speed, however, I was still a little worried about the pain coming back again. Signed up soon for the BRM and also managed to convince Rao to come along on his single speed. Suraj my first 200 BRM ride partner was also getting back to cycling and joining us. Nishant was to join and ride with us to any distance he could manage with an ankle injury. Mayur, on the other hand, was attempting the 300. With a start time of 200 being set for 6 am demanded a bit of planning. We were going to face the cold Pune morning and as the day would progress, it would definitely be getting hot under the sun. I had set a personal target of 11 hours which would allow me to be back home for an important meeting and give me a small window for some sleep before we left for a night drive to Goa and back the next day. Picked up a couple of packets of Enerzal, some sweet buns, some packet of cheese cubes, Snickers and some energy bars. I knew that we are going to need a lot of salts in the heat. Also planned to pick up some bananas at the Checkpoint at Satara. Food stops were out of the question with a target of 11 hours on a single speed. I was hoping to manage an average speed of 22 kmph. As usual, woke up at 4:15 am, thankfully managed to get some 6 hours of good sleep. Ate two boiled eggs and a banana and washed it down with some black coffee. Carried the cycle down 2 floors, just to remind me how heavy it was. After a short two-minute dynamic stretch session, I started off for Pune University. Was joined by Nishant on the way and we managed to reach Pune university at 5:35 am. The place was crowded with over 80 riders, most of whom were doing the 300. The formalities and bike check took some time. At 6 am the ride was flagged off and I was still waiting for the bike check formalities. Rao and Suraj took off asking me to catch up. My bike check was finally done by 6:07 am and I was off at 6:08 am. Being one of the last ones to start, ensured that I was alone. The first section had two difficult climbs, the short Chandani chowk climb and then the long drawn Katraj tunnel climb. I decided to take one thing at a time and started slow. By Chandani chowk climb I managed to over take a few riders. Definitely, a confidence boost, because all the riders were on geared bikes and some on road bikes. Managed Chandani chowk climb with some off the saddle efforts and hit the highway. Soon I reached Katraj new tunnel climb. The usual two-part climb with an easy gradient first part, a flat and then a difficult steeper second part. Met Rao, at Navale bridge and we started the climb together. Decided to take it slightly easy today. Last time I had Bipin breathing down my neck and I had managed to push a little on the first half. Today was slightly slower, but with a single speed, one does not have many options. I managed to overtake a few people on the climb and finished with Sachin Wakade. Right as I entered the tunnel, which is also a climb, I decided to dig into my pockets for some nutrition. Fetched an energy bar and ate it before exiting the tunnel. The other side of the tunnel is a nice descent. I was managing good speeds of over 30 kmph +. Decided to take a pee break and probably a few photos near Mc Donalds. Could not manage the photos as I saw Rao, riding express speed. Quickly jumped on the bike and joined Rao. We rode together with some good speeds and cadence. At a point Rao mentioned that he was riding at a cadence of 90, I would have lesser with my taller gearing. We decided to stop at Shirwal at 60 km mark and take a quick breakfast and water refill break. Reached at around 8:30 am, which was just slightly more than my usual timing on the previous few BRM’s. We quickly refilled our bottles, ate a piece of cheese and sweet bun and a cup of tea. Noticed the average speed of 26.5 kmph. We wrapped up the break in under 8 minutes and while loading the bottles, the cycle kind of slipped, but I managed to hold it. Got up on the bike and started to ride and heard a loud noise from the rear. I quickly stopped to realize the side stand was getting stuck in the spokes. After 2 minutes of pulling and pushing and no success, we took a spanner and removed the side stand. Thankfully no damage. The break lasted 12 minutes with this small mishap. We headed towards Kambhatki. The biggest challenge for the day. I knew that to climb Kambhatki on a single speed, I would need to apply a few basic techniques. Kambhakti because of its twists and turns meant that some sections were steeper than the others. Rao and I managed the first section pretty quickly. I slowed down a bit for Rao to catch up on the flat section before we attacked the second section. We met Sunil K at the start, had a quick round of exchange of pleasantries and started the climb. Kambhatki was mostly an off the saddle effort. We tried to take the outermost lane on most of the turns to negate the extreme elevations on the innermost lane (normal banking of roads). One section, I had to attempt on the innermost lane, due to heavy traffic. This particular section also it seems had some insane gradient. I had to stand on the pedal and do some half pedal to manage to not put the feet down and walk. Just as I managed to pull through this section and move ahead, I saw Rao struggling on the same section. I pulled through to the top and started descending. Rao was out of my visible range by now and I thought he would quickly catch up. The kambhatki climb was done in 26 minutess, just 3 minutes more than my efforts on the road bike. The decent from Kambhakti meant some gain in momentum and rhythm. I decided to continue this rhythm and continue until Wai Phata, where I thought Rao would catch up. Receive a call from Rohan Kumbhar, who was on his way to Kolhapur for his iron man attempt. Got to know that Sidhu had multiple punctures and was struggling. Stopped at Wai phata for a drink and to refil the primary bottle. Also grabbed snickers. 5 minutes and I did not see Rao. I thought he must have stopped to speak with Rohan and so I decided to continue. Rao had not called so I thought things must be ok with him. I took one more short break to pee and still had no sight of Rao. By now the heat was increasing tremendously and the struggle was starting to get real. I decided to make a quick dash to the CP. I reached Nagewadi CP at 10:40 am. The timing was just 15 odd minutes more than my same attempt on the road bike or the hybrid. The speed was 24.9 kmph, with a ride time of 4:13:21 for the 105 km. I quickly filled the water bottles, picked up a few Enerzal packets because the sun was going to take its toll from here. Gobbled two bananas and picked up one for the way. Got to know from Sunil that Rao had a puncture while descending from Kambhatki. I mentally made a note to abuse him later for not calling me immediately after he had his puncture. I decided to check my wheels and realized that one of the spokes was hanging around. The side stand incident had its casualty, a broken spoke. Realized that the wheel was indeed wobbly. Prayed to god, and hoped that I would be able to complete the ride. More than finishing the ride, I was more worried now about reaching back home soon, as I had work commitments at home that evening, and of course, I route recce plan to drive to Goa that same night. This whole incident ensured that my planned 10-minute break was converted into a full 20 + minute break. Just as I headed back at 11 am, I realized the heat was going to be the biggest enemy, other than the constant inclines post-Shirwal. Received a call from Rao and realized that he was still working on the puncture and was 7 kms from the CP. I asked if I should come back and help him as I was already on my way back. He told me that he was almost done and would not need help. Decided against waiting for him as he would take almost 20 minutes to the CP and then the CP formalities. This meant that I was going on a solo journey on return with a broken spoke. 30 minutes into the ride and I was struggling with the heat. I had Electral in both the bottles now, but the water was hot and undrinkable. The heat was slowing me down terribly. I decided to push my way to Kambhakti tunnel and take a cold drink break. I had consumed more than a liter of water from CP to kambhakti tunnel and definitely needed a water refill break. Just as I reached Kambhatki tunnel, I decided to pull through the tunnel, use the advantage of the decline and then stop on the other side. Just as I was coming down the tunnel, I finally saw a rider overtake me. I was relieved to see another rider, however, he was on a road bike and quickly zoomed past me. I stopped post the tunnel, grabbed a Thumbs up the bottle and a piece of sweet bun. Poured some cold water on my head and felt instant relief. Started back again and the happiness lasted just 30 minutes as the chilled water effect evaporated and so did my water bottles. Unlike the other few times, I noticed that the Nira shops were open again. I found one such shop around Nasrapur and decided to refill my water bottles. I also grabbed two glasses or Nira and treated my body to another cold water splash. The shop owner decided to take a favor from me and asked me to call up a number to recharge his phone. This whole drama of calling another person took around 5 minutes. Quickly got on the saddle and started back. The climbs in the heat and the single speed were getting difficult. Specially the wobbly wheel brushing with the brakes. My speeds were dropping down to 16-17 kmph or even lesser in some section. I also started to notice some pain in my knee, from my older quad injury. I decided to take things easy and not push hard. When I started in the morning, I had set a target of 11 hours for completion, but the first half ensured some hope of an under 9 hours finish. The second half heat and the return of the pain in my right leg pushed the 9-hour hope out of reach. The last patch is the toughest part of this route. The inclines start post-Shirwal with a few long and slightly steep flyovers. I noticed that the rider who crossed me at Kambhatki tunnel was around in this section. He was probably struggling with cramps and we both constantly played the overtaking game on each other. He would go ahead on the flats and I would gain on the inclines. The decline on the Katraj tunnel was a huge relief, it also meant that I was very close to the finish line. The traffic around Warje was bad, and I rode cautiously. The pain in my right leg forced me to decide against climbing the steep Chandani Chowk and I decided to walk that final leg. Not before I felt a loss of energy and fished for my last energy bar. I reached CCD Chandani chowk at 3:20 pm. Finally had managed to complete the BRM in 9:10 minutes, officially 9:20 minutes with a ride time of 8:13 for the 201 kms with an average of 24.5 km on a BSA Mach Single speed. The ride was more to prove to the world the fact that one does not need an expensive bike to do rides. Yes, expensive bikes make things easy, comfortable and many more things. But it is more to do about your own personal training and determination than just the machine. Surprisingly I was the third guy to finish the 200 that day, just a minute behind the guy who finished ahead of me. . This was majorly possible because most of the good riders were participating for the 300 BRM the same day. But hey my last 200 BRM on the same route was completed in 11:40 on a 21 gear hybrid. In roughly about 6 months I had managed to shave off 2 hours and 20 minutes and that too on a steel single speed bike. On a side note, Rao also managed to finish the BRM and I was very happy for him because he not only managed to finish the BRM on a single speed but he managed to get his personal bests on all climbs and even for the 200 BRM completion. What is the next challenge for me? Probably I would want to attempt a 1000 BRM, but my heart is right now set on Everesting on the bike. Read more about Everesting on the cycle here. But I would need loads of training and some funds to attempt that. Hopefully sometime next year. During the ride: 3 bananas, 2 Rite bite energy bars, 1 Snicker, 2 sweet buns, 1 cheese cube, 2 packets of ORS, 7 liters of water, 2 glasses of nira, 1 cup of tea. Post Ride: 1 Chicken Sandwich and black coffee at CCD after the ride. Check out my ride on Strava here. Wonderfully written!!! Helmet off to your brave effort! Thanks a lot for writing out all details!!! Salute. Hey…such a inspiring guy u r…. Hello Pranab. Welcome back to the world of cycling.